basil | What's for tea tonight dear? If you plan to go shopping in the smaller local markets of Phnom Penh my two top tips are 1) do so with a local guide and 2) plan things such that you don’t go with a hangover. My one day Cambodian cooking course began with a nine o’clock tuk-tuk ride to Kandal Market and being accompanied by our teacher and chef Heng took care of number one. A thorough and comprehensive introduction to the bars of the Cambodian capital the previous evening however is why I am able, with some authority, to offer the second piece of advice. 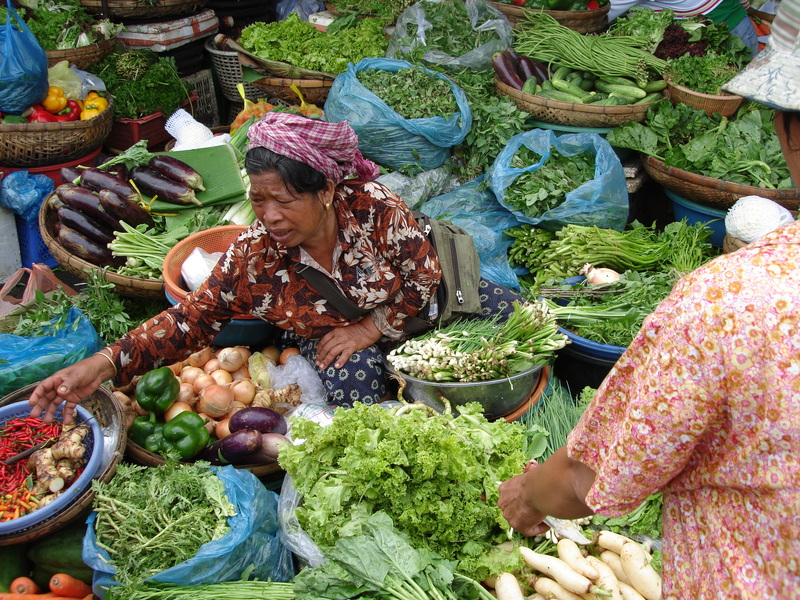 Cambodian markets are lively, colourful, noisy places and there is no shortage of stimulation for all the senses. Most Cambodians will make daily visits as fridges are a rare luxury, but some of the sights and smells can prove something of a shock to an unsuspecting westerner who’s had one or two too many the night before. 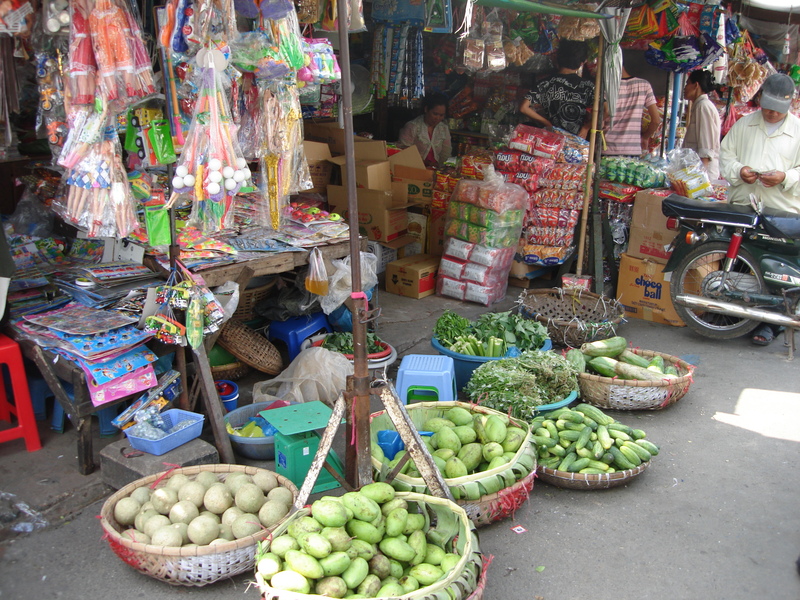 Fruit and vegetable stalls will be piled high with produce both familiar and not, with herbs like fresh caraway a real revelation, and shouldn’t overly challenge the constitution, unless of course you’re surrounded by a large quantity of ripe Durian on a hot sunny day. Venturing further into the narrow alleyways [and avoiding the motorbikes which people will ride down them] the atmosphere ripens amongst the stalls selling poultry, pork and fish – alive, dead, dried, or despatched to order – until you come across the highly prized ‘Cambodian cheese’, Prahok. 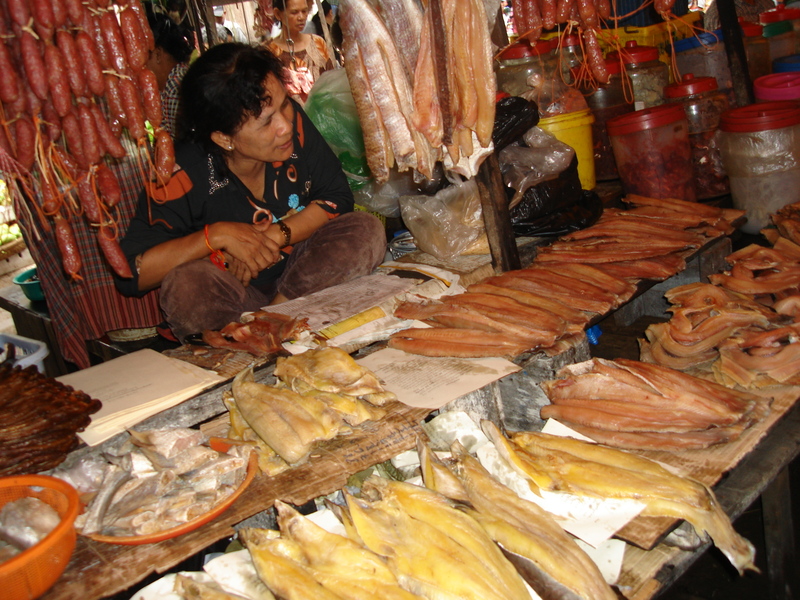 Prahok is crushed, salted, fermented fish which is allowed to mature for up to three years. 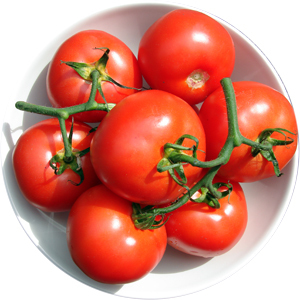 It is added to soups and sauces, or just eaten raw as a dip with vegetable crudités. It’s a rich, heady brew, and is your first real reason to avoid this trip whilst worse for wear. After the Prahok baskets of sulphurous charcoal aged eggs [similar to a Chinese century egg] will barely raise a nostril. My first visit though was rounded off by a visit to a frog stall. A steel tray held deep layers of frogs, all freshly skinned, beheaded and shining in the morning sun. It turns out that a recently skinned and decapitated frog doesn’t need any encouragement from Mr Volta to flex its muscles, and two of the beasts leapt out and onto the street and began hopping blindly about. A lady intent on her morning shop didn’t notice and stepped on one – the headless frog of course had precious little chance of seeing her coming. This is when you really wish you’d gone to bed early with a cup of tea the previous evening. Whatever else you stumble upon one thing you will find is banana blossoms in abundance. 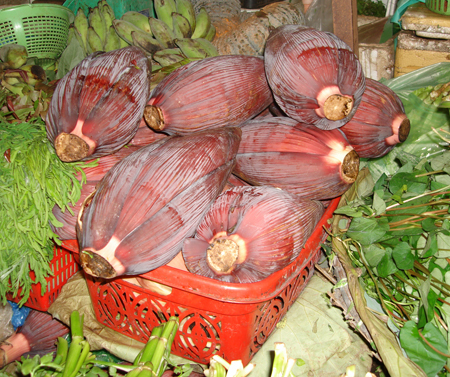 They resemble purplish brown elongated cabbages around 45cm in length. The tender creamy white inner layers are the edible parts, and as you strip away each layer to get to them you’ll find little proto-hands of bananas between each. The petals are rolled and thinly shredded, but discolour quickly so need to be immersed in water acidulated with lime juice as soon as they are cut. Whilst they’re slightly less abundant here they are by no means impossible to come by; my local Thai supermarket has them in stock ‘from time to time’ and recommends that if you see one you should buy it, but they also stock a tinned version which I had to buy but am yet to try. 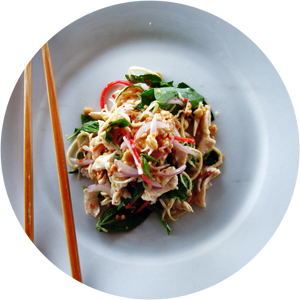 If you absolutely cannot track one down then use finely shredded hard white cabbage instead. You will need around half a large or one whole small petal layer per person. The dressing can be made a few days beforehand and stored [covered] in the fridge. Chop the chilli finely and crush the garlic, then smash together a little with a mortar and pestle but do not reduce to a paste. 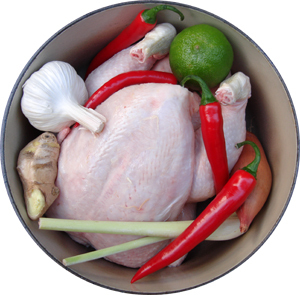 Mix all the other ingredients and stir to dissolve the sugar, then add the chilli and garlic. To make the salad roll the banana ‘petals’ into cylinders and slice finely across to produce strips about 1mm wide. Place these into the cold water with lime juice to prevent browning. Drain after five minutes. Tear the meat into thin strips with your fingers. Toss everything together in a bowl and add the dressing bit by bit until you are happy with the balance of flavours. 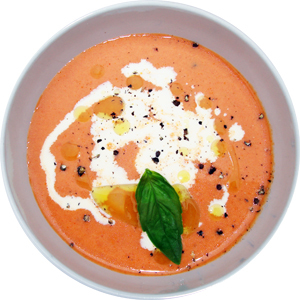 It should be sprightly and fresh, lively with herbs and with a kick from the dressing.